Many animals sacrifice for the sake of their children, but red crossbills are on another level entirely. Crossbills with kids have dangerously low stress hormone levels compared to their childless couples...all to make sure they don't suddenly abandon their nest. 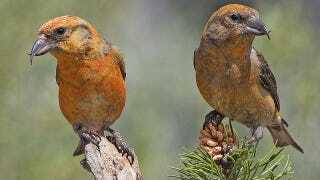 Red crossbills, who rather confusingly are a type of yellow-breasted songbird, are found throughout the western United States, which means they have to deal with some fairly long, cold winters. The average bird will survive this by upping their levels of corticosterone, otherwise known as the stress hormone. Increased corticosterone can carry with it some serious survival advantages by allowing the bird to tap into and release its sugar stores, keeping their energy levels up. That's all well and good for unattached red crossbills, but those with babies to think about face a more tricky decision. Corticosterone also tends to make birds more flighty, often causing them to simply abandon one nest and move on to another place. Researchers have discovered that the crossbills have somehow developed a way to lower their stress hormone levels while they are reproductively active, meaning they are far less likely to suddenly abandon their offspring. This rather nifty trick carries some definite risks - the crossbills are less likely to survive the winter without the ability to tap into their sugar stores. While they're probably not consciously deciding to mess around with their stress hormone levels, this does suggest a rather fascinating choice "made" by their own evolutionary history: either keep corticosterone levels up and risk the birds abandoning their offspring, or keep them down and risk the birds dying in winter and leaving their offspring alone anyway. It's a brutal reminder that evolution only comes up with the best possible adaptation for a particular environment, and unfortunately there's no such thing as a perfect solution. Via ScienceNOW. Image by Elaine R. Wilson.